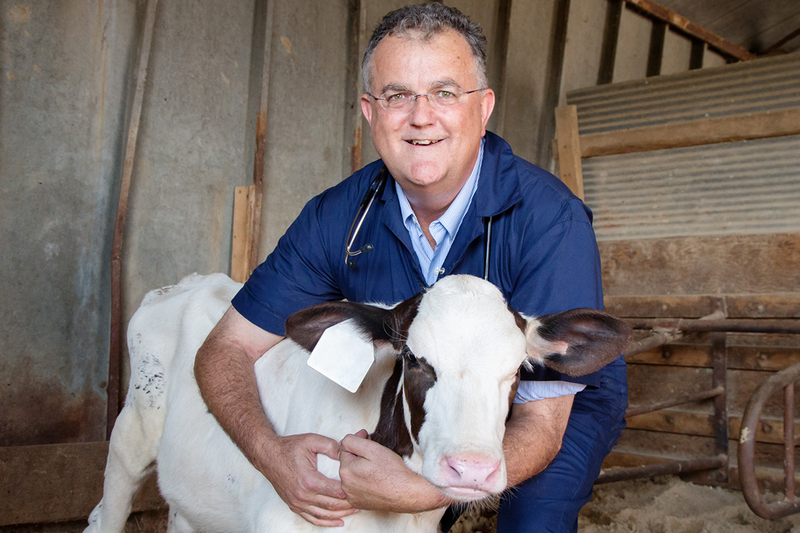 In a new study of more than 1,400 critically ill calves with diarrhea, Peter D. Constable and his colleagues found that clinical signs of disease were better predictors of mortality than the laboratory data that clinicians have relied upon historically. Constable is the dean of the College of Veterinary Medicine at the University of Illinois. CHAMPAIGN, Ill. — Clinical signs such as gastrointestinal problems or septic arthritis may be better predictors of mortality in neonatal calves with diarrhea than blood pH levels and other laboratory findings, a new study suggests. The research also may finally resolve a century-old debate among scientists about the blood pH levels needed to sustain life in humans and other mammals. By analyzing data in the medical records of more than 1,400 critically ill calves, scientists were able to ascertain which indicators were significant determinants of mortality. All of the calves in the study had diarrhea and other clinical signs, and were under 21 days old when they were admitted to the Clinic for Ruminants at Ludwig Maximilian University of Munich between April 2005 and October 2012. Peter D. Constable, the dean of the College of Veterinary Medicine at the University of Illinois, co-wrote the paper with colleagues Florian M. Trefz and Annette Lorch, both of the Center of Veterinary Clinical Medicine at Ludwig Maximilian University of Munich; and Ingrid Lorenz, of the Bavarian Animal Health Service. Published online in the scientific journal PLOS ONE, the study is believed to be the first retrospective data analysis involving a large population of critically ill animals, 22 percent of which had blood pH levels below 7.0, Constable said. Critically ill calves with diarrhea typically exhibit dehydration, depression, loss of the suckling reflex and impaired ability to stand, according to the study. Diarrhea also increases calves’ risks for serious metabolic problems, including high levels of acid in the blood, a condition known as acidemia; and high concentrations of lactate in the blood, a strong predictor of mortality because it results from decreased blood flow and oxygen delivery to the tissues, Constable said. One of the treatment goals for patients with severe diarrhea is to return their blood pH levels to normal limits using fluid therapy. Calves in the study were treated by administering electrolyte solutions orally or through IVs, along with antibiotics as needed. The mortality rate in the study population was 22 percent. Historically, veterinarians have relied on laboratory tests to predict treatment outcomes in neonatal calves. However, in analyzing the data associated with the animals in the current study, the researchers found that the top four predictors of mortality were clinical signs rather than laboratory findings. Using a technique called classification tree analysis, the scientists found that signs of neurologic disease, gastrointestinal problems, orthopedic disorders such as septic arthritis, and cachexia – a condition commonly known as wasting syndrome – were better predictors of mortality than patients’ blood pH levels. Data on blood pH levels were not sensitive enough or specific enough to reliably predict mortality, the researchers found, except when these levels dropped below 6.85, indicating profound acidemia. Normal serum pH level is 7.4, Constable said, although there has been much debate among scientists as to what blood pH range is compatible with life. Fifty-four percent of the calves in the study had blood pH levels below 7.2, indicating severe acidemia, with the lowest recorded pH level in the study population being 6.47. “There’s a lot of experimental data out there that says if blood pH falls below 7.2, patients tend to have many other comorbidities, but it’s difficult to say whether those are caused by acidemia. If you’re an Olympic rower, and you’ve just strenuously exerted yourself to cross the finish line and win the gold medal, your blood pH level could fall as low as 6.8. Yet, you’re performing at a very high level,” said Constable, whose research interests include cardiovascular responses to endurance training. The study’s findings also can help clinicians identify independent prognostic indicators in children with severe diarrhea, which causes 15 percent of deaths worldwide in the population under age 5. The paper “Clinical signs, profound acidemia, hypoglycemia and hypernatremia are predictive of mortality in 1,400 critically ill neonatal calves with diarrhea” is available online or from the News Bureau.